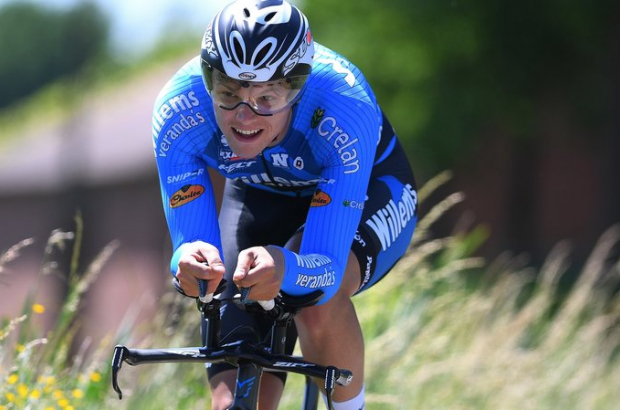 From Flanders Today: Flemish pro cyclist Michael Goolaerts had died following a crash during the Paris-Roubaix road race on Sunday. The cause of death has been determined as cardiac arrest. Goolaerts (pictured), who pedalled for Véranda’s Willems-Crelan-Charles, fell on the second set of cobbles at the 109km mark of the 257km race. He was revived by paramedics at the scene before being flown to hospital in Lille. His team announced his death on social media last night. It is unclear is Goolaerts, 23, suffered the problems with his heart before or after the crash, but the public prosecutor in Cambrai said that an autopsy would be carried out. Goolaerts joined Véranda’s Willems-Crelan-Charles, based in Mechelen, last year following his first pro stint with Lotto-Soudal. The Lier-born rider had taken part in several of Flanders’ road races, including Dwars door West-Vlaanderen, where he placed ninth, Kuurne-Brussels-Kuurne and the Tour of Flanders. I am impossibly fulfilled to see this amazing piece of work. I am not all around lively seeing an article yet rather your articles have unending made me enthusiastic. These nooks are extraordinarily profitable and engaging. The lives of the heaps of and thousands are orchestrated because of the content and information close by on sites. The capacities of the news channels and telecasts are assessed and executed. It is performed and advantages are expended. It is essential and phenomenal.Best essay writing service is the better service that provides detailed and effective information related to educational basis.